Oh boy, I still remember that unique Saturday morning when I saw the first episode of the SpongeBob series! I was amazed to see that there is actually life underwater and that the creatures living there have an exquisite sense of fashion, that they have friends, prosperous business and also tiny little problems. Life is great and agitated in the fictional underwater city of Bikini Bottom and when it gets boring, SpongeBob SquarePents and his friends always find a new adventure to spice it up a bit! Girls, today you're going to discover SpongeBob's great underwater world as you're his special guest there, how cool is that? You're invited to pack all the things needed in your special hair stylist kit, get the 'Spongebob Haircuts' hair game started and begin a wonderful journey among friendly fish, colorful seaweed vegetation and other creatures living there on your way to the city of Bikini Bottom, the place where no one has been before. 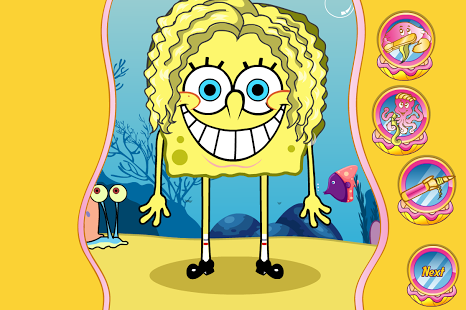 Hurry up girls, SpongeBob is anxious to meet you and he can't wait to let you play with his long and rich hair-locks. He needs a new and highly original haircut, but firstly you'll have to take a proper care of his hair and wash it with the right type of shampoo in order to obtain a silky look for it! Use the hairdryer to obtain an extra volume. Once this step completed, go to the next page of the game, pick those professional pair of scissors and start cutting SpongeBob's hair until you get the desired length. Use your favorite hairstyling tool to arrange his brand new haircut a bit and then feel free to check out the palette of colors available at your disposal in this hair care game and start dying it up in your favorite shades. Then choose a funky pair of square pants to dress him up with and don't forget to also check the hair accessories option to complete SpongeBob's brand new look with! 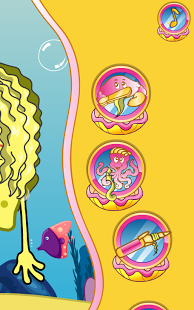 Have a great time playing the 'SpongeBob Haircuts' game!